I had a couple of questions about where I got my John Deere 12-A combine from or did I scratch build it. The combine comes from GHQ Models and happens to look like a 12-A. It is a nice little combine. The actual machine was built from 1940-1951. So this model fits my 1959 era. It has a PTO drive but the real combine also came with a "ULC" independent motor if your tractor didn't have PTO or live PTO. 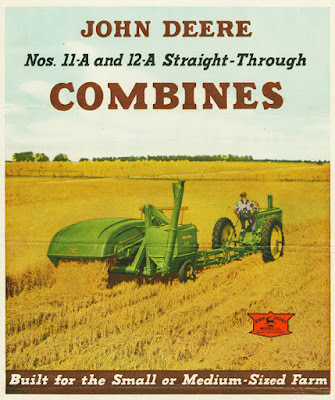 John Deere then released the model 25 from 1952-1955 and then the model 30 from 1956-1961. The 30 combines are slightly different as they can have a pickup and have a table auger with enclosed feeder house. In this era John Deere also released the model 65 in 1958 but there are no HO scale models of this machine currently available. During this era John Deere also released 3 other self propelled models. The 55 1947-1959. The 45 1954-59. The 95 round back 1958-59. There are no HO scale models of these at this time. There are models in S scale so you could build a model taking measurements off of one of these. Finding historical information on farm equipment is not very easy. Finding info on tractors is much easier. All of the above information applies to what you would have seen on the Canadian prairies. I am just scratching the surface of this topic as there are other manufactures such as Massey Harris which was a Canadian company that was a power in combines. GHQ has some other nice models - as you will see on their page - that happen to represent real life machines. North American farm equipment in HO scale of any kind is hard to find. To build this combine you just have to remove a little bit of flash from the metal parts and glue it together using CA or 5 min epoxy. The reels are etched brass and look really good but you have to take care working with them. I painted some of the drive belts black which takes a steady hand. I have a very small brush, you could also try using a tooth pick to paint with. The feeder house on this combine is canvas with wood slats. same as swather canvas. It is a light grey colour when new and the slats were unpainted wood. I had the decals custom printed as none come with the model. The model dosen't come with the straw spreader so I am considering building one. Because it is a 6' straight through I doubt the speader did much. I have added the straw deflector and the table lift arm though. The color of the reel bats are hard to tell as I only have black and white pictures - they may have been painted green. You can see in the John Deere add above they show reels and bats painted yellow. I painted mine plain wood with a little green colour as much of the paint would have been worn off by 1959. Here are some pictures of the 12-A that is in Camrose at the museum. This has tines along with wood bats on the reels. It also has the independent ULC motor to drive it. The other thing of note when looking at this combine is that the combine is set to the left of the hitch. If you look at the hitch of a JD 65 the combine is on the right side of the hitch looking at it from the back. This change of rotation from going counter clockwise to clockwise around a field occurred on other towed equipment in the 40's and 50's. You can find lots of pictures and a few videos on the internet of any of these combines. I just can't post them because I do not have permisions. In this picture you can see where the motor is mounted on the left side in the picture. The hitch is swung over to the transport position. The canvas feeder is not installed. 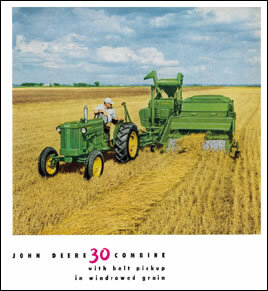 This John Deere add shows the model 30 with a motor drive. Note the pickup and table auger.